This weekend was Christmas gifts time in our kitchen. 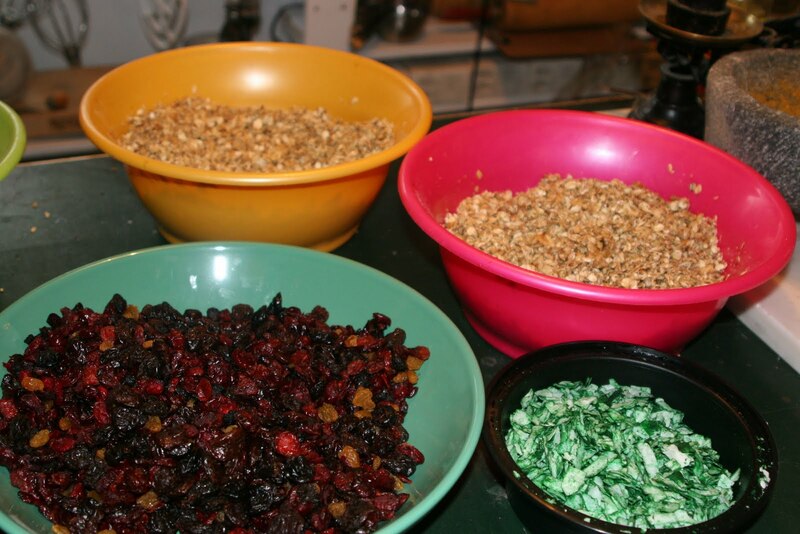 This year we made our Christmas granola. 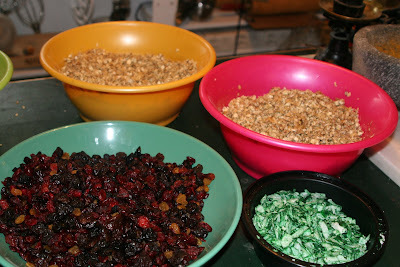 If you like granola, there are probably "favorite" ingredients that you will want in it, so a recipe is very subjective. My friends are all big on flax seeds, so some end up in my granola. I don't like nuts in my food (do not take this as an opportunity to convert me to your Grandma's Nut Balls or Uncle Bubba's Squirrel Almondine), but I will acquiesce to walnuts and they seem to another fave of all my friends, so my recipe has walnuts. 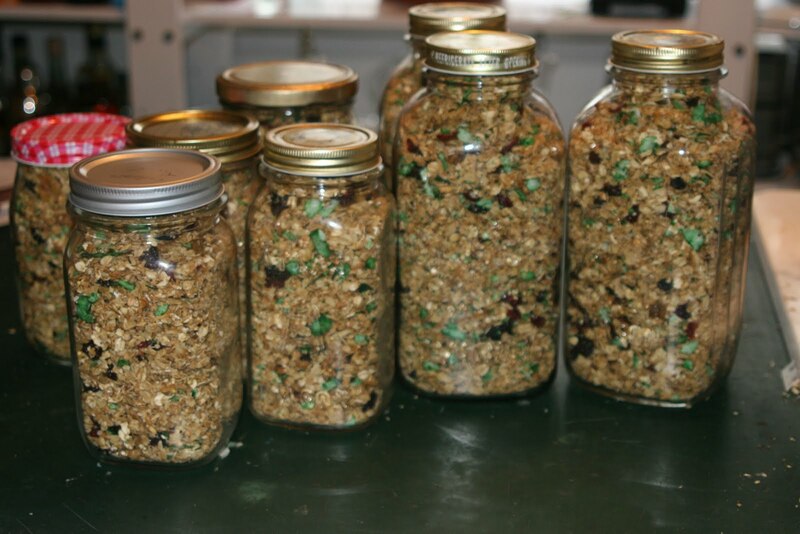 Here is a general rule of thumb recipe for concocting your own very personal granola. Basically, granola is a tub of rolled oats (oatmeal) with some sugar and oil added. It is baked till a bit crunchy, removed from the oven where raisin are added. Voila -- granola. 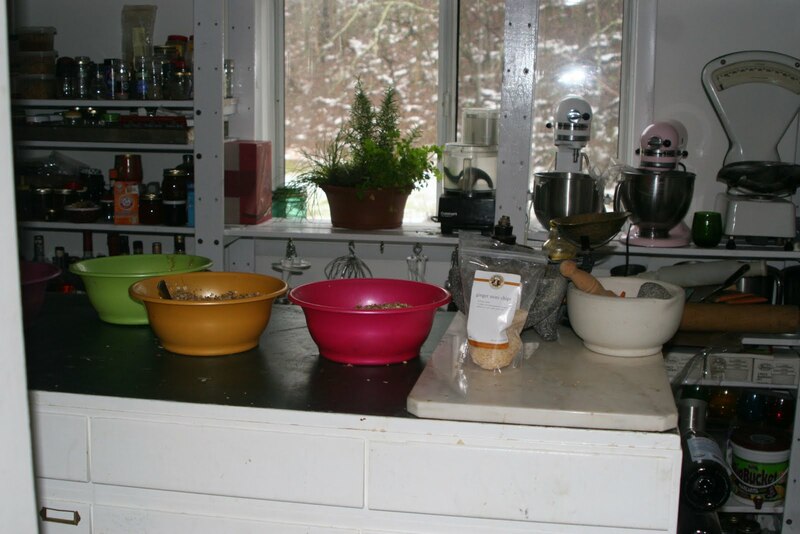 4 parts oaty -- basic rolled oats, steel cut oatmeal, etc. 1 part crunchy -- This year, I used a Harvest Grains Blend from King Arthur. It has oat berries, millet, rye flakes, wheat flakes, flax, poppy, sesame, and sunflower seeds. I think of "crunchy" as more seedy and flaky than nutty, however, if you love nuts, you can use this "crunchy" part as an additional "nutty" part. part of my "nutty" but it can also be a "chewy" part. 1 part syrupy -- this is your sweetener with honey being the most popular, but agave works, Karo works, maple syrup works. This year I used the tried and true Alaga Syrup direct from Alabama. It has a sorghum taste to it. 1/2 part oil -- if you don't have a strong point of view, use a non-descript canola. I am fond of a fruity olive oil, especially if I choose pine nuts as part of nutty/crunchy selection. 3 parts chewy -- for Christmas I always use "red chewy" things like cranberries, cherries, red grape raisins, even pomegranate seeds. Mix all of this oaty, crunchy, nuttyness together with the syrupy/oily elements and bake on cookie sheets at 325 for about 30 minutes. A large batch will take several trays of baking. When the baking is finished, allow the mixture to cool and add the chewy parts. Mix thoroughly and put in, bags, bottles, or cans for lovely treats for you and yours. *A Note on Tinting Coconut. I tint my coconut a festive green for the holidays. Take about 1 ounce of green food coloring and squirt it in a plastic bowl with a cover big enough to hold your coconut. (Also, be prepared to throw the bowl out after using as it may not come clean.) Add the coconut to the container and shake it about until the coconut is tinted a nice green. Another work of warning: Harrylowe, who gets this granola, likes to heat up his milk and pour it over the granola which results in a ghastly green milk. Kids will no doubt love it, but it is something to think of before you tint the coconut. Love your site! I wish it was Christmas so I could eat your weird green granola (as you foreigners call it) while a listening to Bob. A friend told me that when he heard Bob's Christmas album he spewed on his keyboard. Obviously needed better sound system - or is it cos my friend is jewish? But he wd love your "granola".